On this page you can download a Windows version of Zebra (WZebra). Playing strength ranging from beginner to strong expert. Many useful features to simplify game-play: Move takeback, move preview (see the position arising after a move has been made and what options this gives the opponent) and board rotation. Several functions useful for analyzing games: A position can be set up on the board, WZebra can analyze a game entered interactively on the board, one can switch colors at any time during a game, WZebra can solve the position for perfect play. Sixteen languages to choose from. Move lists in any reasonable text format can be imported and analyzed. Practice session mode where WZebra displays its evaluations of all available moves - great for learning and understanding openings. WZebra can learn a game played and add it to its opening book. Support for the Thor database. 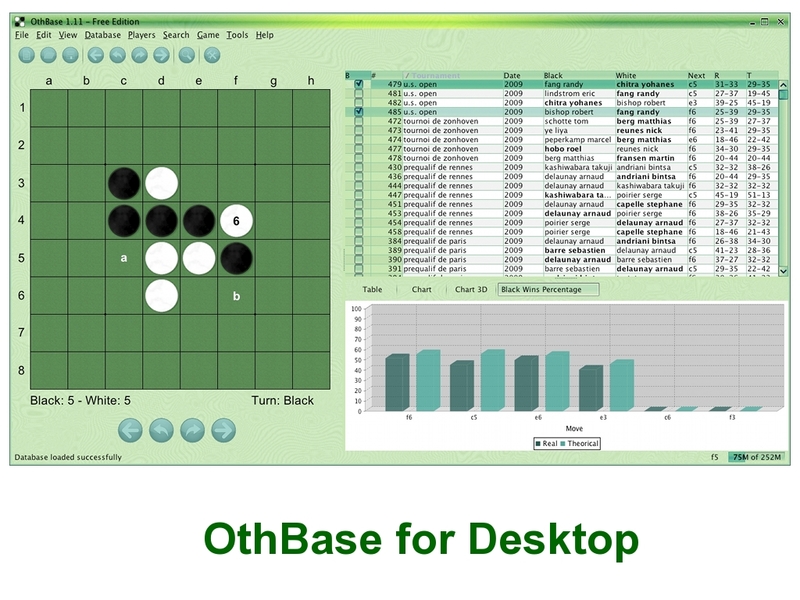 OthBase is an Othello Games Database Manager that enables creation and analysis of Othello games databases. 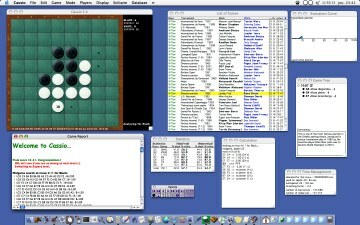 Use Cassio to play the game of Othello against the program. Review and analyze games. Browse through the WThor database for instant access to 90000 tournament games. Practice your endgame skills by solving graduated puzzles... Cassio is a powerful, simple, fast othello board for Mac OS X.